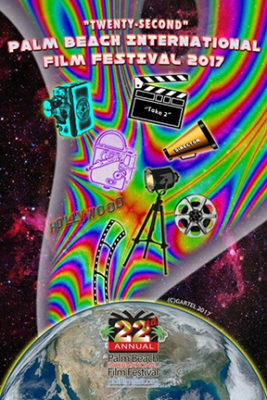 The 2017 official 22nd Palm Beach International Film Festival (www.PBIFilmFest.org) poster created by GARTEL (Laurence Gartel) is exclusively designed and dedicated to filmmakers around the globe. GARTEL’s famous fusion of artistic colors will stay in style forever, adding excitement to any wall or space on the planet. GARTEL has authorized exclusively for PBIFF to sell signed limited edition posters to benefit the festivals missions, scholarships for film education at a price of $250.00 each online sale only. “This poster captures GARTEL’s work that artists, filmmakers and our patrons of the film and arts will truly appreciate and remember,” said Jeff Davis, President, Palm Beach International Film Festival. “It’s a piece in time that’s ‘out of this world’ that will make a lasting impression for many years to come,” added Davis. GARTEL is best known for his work with Andy Warhol in the earlier years of his career and creating groundbreaking artworks for the NBA, Walt Disney Corporation, Coca Cola and The Grammy Award 2015. Later, commissioned by Telsa Motors for an “Art Car Miami” design, that eventually lead to other luxury brands such as Ferrari Scuderia, Rolls Royce and Mercedes using his art designs. While patrons have an opportunity to the 2017 GARTEL poster, the festival has lined up great browsing creations by South Florida residents and members of the Inventor’s Society of South Florida (www.inventors-society.net) to showcase their current inventions. Fine artwork from artists on virtual reality Easton Art Galleries (www.eastonartgalleries.com) art will be on display through out Keiser University on Saturday, April 1st, 2017 for all that attend. “The inventors are thrilled to display their inventions and be a part of PBIFF-2017,” said Leo Mazur, President, Inventors Society of South Florida. “All my members are looking forward to being at Keiser University for all those enjoying the films and to have a chance to see their inventions,” Mazur added. 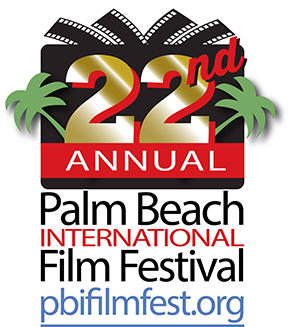 For information on movie schedule, events and sponsorship, visit www.PBIFilmFest.org. LAURENCE GARTEL, is known to the world as the “FATHER” of Digital Art for nearly 40-years. His career started working side by side with video guru Nam June Paik at Media Study/Buffalo in upstate New York. He taught Andy Warhol how to use the Amiga Computer in order to produce the album cover for Debbie Harry (Blondie). Growing up in New York City during the Punk Rock era he was friends with Stiv Bators, Sid Vicious, Joey Ramone, Wendy O. Williams, and exhibited his work with Robert Mapplethorpe. Creating Digital Art before the birth of the personal computer his work has been exhibited with the Museum of Modern Art, Long Beach Museum of Art, Princeton Art Museum, Norton Museum of Art as well as included in the permanent collections of the Smithsonian Institution’s Museum of American History, Bibliothque Nationale Paris and Victoria and Albert (V&A) Museum, London. Gartel has traveled the world exhibiting and projecting his work in Australia, Spain, Germany, Italy, as well as going to India, creating a Bollywood Music/Video for Universal Entertainment. He has been commissioned to produce artwork on Britney Spears, Justin Timberlake, Red Hot Chili Peppers, as well as for corporations such as Coca Cola, Philip Morris, Walt Disney, National Basketball Association, Gibson Guitars, Bang & Olufsen, and known to most for his ABSOLUT GARTEL ad for Absolut Vodka. Easton Art Galleries (www.eastonartgalleries.com) was created to support fine art. Growing the new generation of artist and art collectors, merging together the latest in Virtual Reality Technology for young artist, who want to sell their art in a user friendly platform. This gives the artists the ability to be their own curator of selling their artworks. Also a complete mobile application for art collectors, enthusiasts and designers to grow their business utilizing fine art. The Inventors Society of South Florida is a 501 (C) 3 non-profit organization dedicated to the advancement of the independent inventor through the use of Education, Motivation and Collaborative Support. Providing inventors the tools to Get The Job Done, a wealth of information to members and the general public regarding all aspects of the invention process through a newsletters, website, guest speakers at their meeting. However, the ISSF does not endorse, suggest, or recommend that any of this information may or should be relied upon without the user’s own independent investigation and evaluation. The Palm Beach International Film Festival is unlike any other film festival in America. It’s renowned for showing filmmakers and filmgoers a good time with parties and glittering special events. In 2015, over 120 films were screened, including 50 outstanding foreign films, representing 24 countries. In 2016, nearly 80 features of the 192 films presented, including 30 World, International, North American, and US Premieres. Over 115 filmmakers and actors attended, many made the trip here to Palm Beach County at their own expense, from countries such as Canada, Israel, Spain, the United Kingdom, and Venezuela, to meet our Florida patrons. Unlike other Festivals, PBIFF has unique partnerships with Keiser University (www.keiseruniversity.edu), G-Star School of the Arts (www.GSTARSchool.org) and The Palm Beach Film and Television Commission (www.PBFilm.com). All partners provide PBIFF with additional space, technical facilities for screenings and production, as well as helping to accomplish our mission statement. The Palm Beach International Film Festival (PBIFF), a not-for-profit 501(c)(3), is one of the most renowned celebrations of cinematic achievement. Filmmakers, Film-goers and Actors from all corners of the globe come annually to Palm Beach County, Florida to showcase their moving works of art. Funds raised by PBIFF provide grants, scholarships with new technology to regional film students aspiring to one day create and feature their own motion pictures. The presence of International film and filmmakers, with South Florida patrons, press and attendees throughout the region, help ensure PBIFF’s place as one of the top film festivals.